You are here: Home » Blog » What Are These Green Levies? And What Are Their Impact On Your Energy Bills? Energy prices seem never to be out of the news these last few weeks. Ed Milliband wants to freeze bills. Energy UK and the National Audit Office warn of staggering price rises over the coming years and energy companies and some in the Tory party want you to believe that rising prices are due to “green levies”. The counter argument seems to be summed up in one word, “greed”. Its all the fault of the big bad energy companies and that dirty word, profit. Things are rarely as simple as all that, so lets take a look at what actually is happening to our energy costs and what part green levies have to play. It’s interesting that in the discussion of energy prices so many want to focus on the 8% that are Environmental and Social costs. It’s really important to note that the biggest driver of UK dual fuel bills is wholesale energy prices. 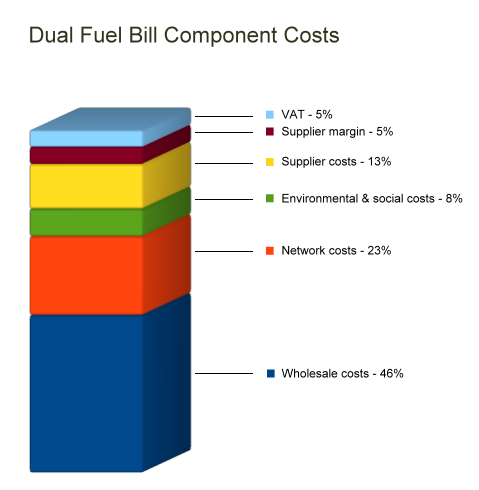 Wholesale costs account for 46% of the average annual dual fuel bill. According to Ofgem, the last ten years have seen wholesale electricity costs rise by 140% and wholesale gas costs rise by 240%. This is going to tie everybody’s hands when it comes to policy. Is a price freeze really realistic when wholesale gas is 8% more expensive this winter than last and wholesale electricity prices are 13% higher? With bills on the rise, environmental costs are going to come under scrutiny and so they should. Ofgem estimates that in the last year wholesale costs have risen by £10 on an average annual dual fuel bill. They also estimate that environmental and social costs have risen by the same £10 and that environmental and social costs will continue to increase over the next 12 months. So what are these environmental costs and what are their impacts? The Energy Company Obligation (ECO) is an energy efficiency programme introduced at the beginning of 2013. It replaces two previous schemes, the Carbon Emissions Reduction Target (CERT) and the Community Energy Saving Programme (CESP). ECO places legal obligations on the larger energy suppliers to deliver energy efficiency measures to domestic energy users. It is intended to work alongside the Green Deal to provide additional support in the domestic sector, with a particular focus on vulnerable consumer groups and hard-to-treat homes. Introduced in April 2002, the Renewables Obligation incentivises large-scale renewable electricity generation in the UK. It requires retail electricity suppliers to source an increasing proportion of their electricity from renewable sources. Renewables Obligation Certificates (ROCs) are issued to electricity generators by Ofgem based on the amount of eligible renewable electricity they generate. Generators sell their ROCs to suppliers, allowing them to receive a premium. Suppliers present their ROCs to Ofgem to demonstrate their compliance with the Renewables Obligation. Suppliers who do not have sufficient ROCs to cover their obligation must pay a buy-out price. The purpose of the Renewables Obligation is to provide financial support for renewable electricity generation. It is in place as part of the Government’s strategy to meet it’s EU target of 15% renewable energy by 2020. The Feed in Tariff has been running since April 2010. The Scheme supports small scale domestic and business renewable electricity generation. FiT pays a tariff, which varies according to the technology and the size of the installation, for every kWh generated. FiT is paid out to homeowners and smaller commercial installations for generating electricity with solar panels, wind, hydro, micro CHP and anaerobic digestion. The Warm Home Discount (WHD) scheme runs from 1 April 2011 to 31 March 2015 and offers a rebate on electricity bills. The Government expects around 2 million households to be assisted annually. It is aimed at older pensioner households on low-incomes who are in receipt of the guarantee element of pension credit and at a broader group, which is defined by energy suppliers, within a framework set by Ofgem. The scheme replaces earlier voluntary social tariffs offered by energy suppliers and was first suggested by the last Government. EU ETS is the EU Emissions Trading Scheme. It is a ‘cap and trade’ scheme. The principle is that a cap is placed on the total emissions from the system. Companies within the system receive allowances which they can trade with others. Companies that have low emissions can sell their unused allowances. The cap is reduced over time, thereby causing a fall in total emissions. The aim of the cap and trade approach is to put climate change on the agenda of company boards across Europe. Putting a price on carbon gives a financial value to emissions saved and promotes investment in clean technologies. It also provides flexibility allowing emissions to be cut where it costs least to do so. The EU ETS is central to the European Union’s climate target of reducing emissions by 20% by 2020. Consensus seems to be that a carbon price of at least €30 per tonne is required to drive investment. After a shaky start, phase 2 of the EU ETS saw carbon prices reach €29 in 2008. Since then there has been meltdown and in January 2013 carbon prices were around €4 per tonne. Under the Carbon Price Floor the Climate Change Levy is used to put a floor on the price of carbon. While the EU ETS carbon price is down the drain that means the price of carbon in the UK is significantly higher than that paid elsewhere. The plus side of the carbon price levy is that by putting a floor on the price of carbon the government is giving certainty to investors and creating conditions that allow investment in clean technologies. Smart metering should put better information in the hands of consumers on their energy usage and are due to be rolled out to all households by the end of 2019. They are expected to encourage more energy efficient behaviour. Interestingly, they are also expected to reduce supply costs in the long term by reducing the costs associated with metering, debt management and customer switching. So, Which of These “Green Levies” do we Drop? The Energy Company Obligation (ECO) is the most expensive of the environmental and social costs broken out in DECCs figures. ECO and the Warm Home Discount scheme are aimed at vulnerable consumers. Energy bills are getting too high so lets stop helping the old and the vulnerable? It doesn’t sound so good when you put it like that, does it? Lumped in with ECO, DECC also includes Green Deal admin costs. Green Deal admin costs don’t amount to much but Green Deal loans and ECO are both mechanisms to allow households who might not otherwise afford it to implement energy saving measures. These might include insulation, draught proofing, double glazing or even renewable energy generation. All measures which lower the energy bills of the customers who are struggling the most. The Renewables Obligation and FiT are straightforward subsidies for renewable energy generators. They seem like a good target for the enemies of all things green. The thing is the UK must invest in energy capacity otherwise a crisis is looming. Without policies to drive investment in renewables we will never meet our targets and carbon emissions will continue to rise. Nobody likes rising costs but we have to have the sense to see climate change as the imminent threat that it is. Warming of the climate system is unequivocal and since the 1950s, many of the observed changes are unprecedented over decades to millennia. Carbon dioxide concentrations have increased by 40% since pre-industrial times. The EU ETS and the Carbon Price Floor also contribute to our electricity bills. They drive up the wholesale electricity price by increasing the cost of generating electricity from fossil fuels. They also support investment in renewables which have higher capital costs but lower operating costs. More renewables creates a downward pressure on wholesale electricity. These things aren’t as simple as some people want to make out. Renewables subsidies add to our bills by making dirty energy more expensive BUT the technologies subsidised tend to have lower costs once up and running. ECO adds £47 (4%) to the average annual dual fuel bill BUT that money goes to reducing the fuel costs of those that need the help and the Green Deal allows all of us to undertake efficiency measures at no up front cost and thereby reduce our energy bills. The Feed in Tariff adds to our average annual electricity bill BUT its cost is negligible (£7 per year, approx 1%) and it funds householders and small companies moving to generating their own renewable energy and reducing the amount they need to buy from the grid. Here is the kicker. The net effect of the environmental and social policies that DECC has identified in our energy bills is not to increase our combined energy bills but to lower them. There are flaws in the operation of the EU’s Emission Trading Scheme and one could question whether the policy of a unilateral carbon price floor is a good idea on competitiveness grounds. You could also question whether these policies shouldn’t simply be funded from general taxation and leave our energy bills alone. The bottom line though is that consumers need to take advantage of these policies to lower their energy use through efficiency measures and maybe to consider renewable energy generation and renewable heat. In doing so, we are all better off. This entry was posted in Clean Energy, Climate Change, Energy Efficiency, General, Green Business. Bookmark the permalink.